This is our last hope... 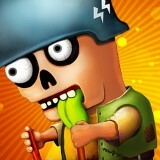 There are so many zombies again and you must do something in order to stay alive and kill all the zombies here. Watch out! They are coming and they are so dangerous. Just use your weapon and clean the world from them.